Featuring 2%^ cash-back on a wide variety of items, in addition to a low annual fee, this card is ideal for someone who wants to earn cash-back but doesn't want to spend too much for the privilege. On top of this, the annual fee is waived for the first 12 months‡, meaning it won't cost you anything to start earning cash-back on your purchases. 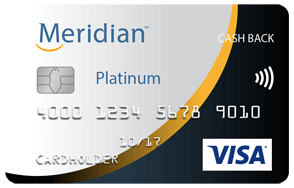 The Meridian™ Visa Platinum* Cash Back Card is a well-rounded product. Some cards offer a higher rate of return, but few can match the low fees, large number of eligible purchases, and impressive insurance package included with this deal. On top of this, you can get additional cards at no extra cost, meaning your family can help contribute to your growing pile of cash-back! So, how does this card stack up to other cash-back credit cards? We crunched the numbers using our Best of Finance methodology to see how much you could earn over a 24-month period. Cash-back earned over a 24-month period: $526.21. Total (subtracting annual fee): $477.21. After two years, you can earn enough cash-back to enjoy a weekend getaway, update your wardrobe or treat your family to a meal at a fancy restaurant! Taking the low fee into account, the cash-back potential of this card is very impressive. Thereafter, the annual fee is a comparatively low at $49. Additional cards are available at no extra cost. Redeem your cash-back for an account credit, merchandise, event tickets, gift cards and more. Get extended insurance coverage, including purchase protection and extended warranty. Travel insurance coverage includes baggage insurance 4++, rental vehicle insurance 3++, travel accident insurance and travel medical insurance. Mobile device insurance provides up to $1000 if your smartphone or tablet is lost, stolen or damaged3+. 2% cash-back rate only applies to the first $25,000 in purchases on the card. After that, you can only earn 1% cash-back on your purchases. This card is not available to residents of Quebec.